A bold renegade who carves a “Z” for his name – a “Z” that stands for Zorro! As the alter ego of Don Diego de la Vega, Zorro suits up in his signature cape and black mask to make a mark against the doers of evil. A skilled swordsman who uses his amazing agility, athletic prowess and calculated cunning to outmatch even the most worthy opponent, Zorro is a charmingly dangerous man. Take a stance against tyranny and suit up in a Zorro costume, available ins sizes for both men and boys. 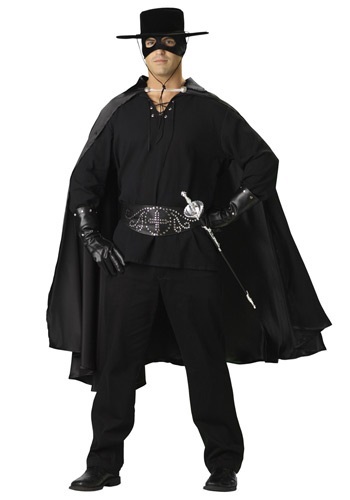 A Zorro costume typically consists of black pants and a matching black caballero shirt. An attached belt, often with Spanish-inspired embroidery, accentuates Zorro’s flair for drama. A full cape to fling over the shoulders will rustle mysterious as you swagger onto the scene to save the day. An eye-mask and gaucho-style black hat will shroud your identity when you step out of the shadows. Of course, you’ll want to add a Zorro costume sword and bull whip for a swashbuckling look. For laughs, dress your little dog up a matching pet Zorro costume.